As if fudge weren't fun enough on its own, coloured sprinkles give our Confetti Fudge even more festive appeal! 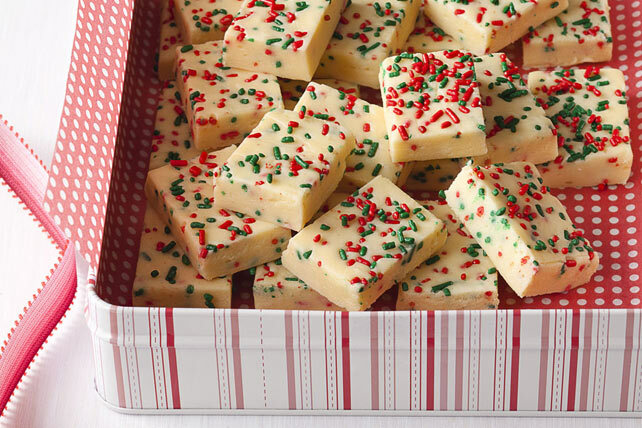 Perfect for gift-giving, this decadent white chocolate fudge is the perfect Christmas treat. Line 8-inch square pan with foil, with ends of foil extending over sides. Microwave chocolate, butter and water in large microwaveable bowl on HIGH 2 min. or until butter is melted; stir until chocolate is completely melted and mixture is well blended. Add dry pudding mix; stir with whisk 2 min. Add sugar, 1 cup at a time, stirring after each addition until blended. Stir in 1/4 cup sprinkles. Press onto bottom of prepared pan; top with remaining sprinkles. Store cut-up fudge between sheets of parchment or waxed paper in airtight container in refrigerator up to 2 weeks.